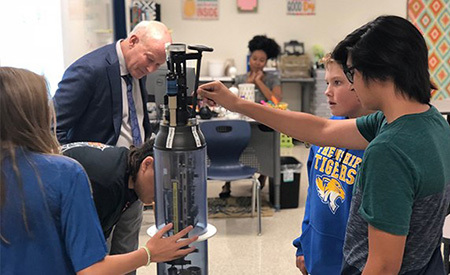 Students at Frenship High School in Texas examine a transparent model of a SOCCOM float during a class visit from SOCCOM researcher Robert Key. Image courtesy of Robert Key. When sixth graders at Seaside Middle School heard that they were going to help with a scientific study of the ocean around Antarctica, they were excited. For several weeks they had been learning about human impacts on the Earth. Now they were actually going to be part of an important scientific investigation of these impacts. In fact, they were going to have their very own ocean-monitoring float! These junior high school students were participating in a six-year, $21 million multi-institution research project called SOCCOM–Southern Ocean Carbon and Climate Observations and Modeling. The overall goal of the SOCCOM project is to collect detailed long-term data on the biology and chemistry of the stormy Southern Ocean. Although the Southern Ocean is one of the most remote places on Earth, it has a huge impact on the Earth’s climate. In fact, SOCCOM researchers are hoping to use their data to improve global climate models. 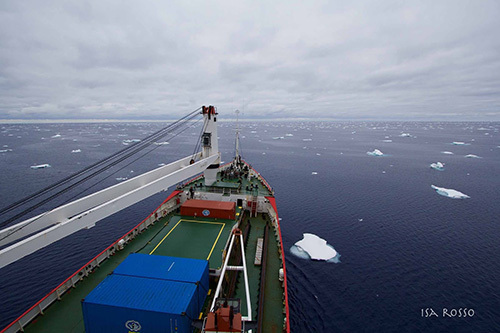 Because the Southern Ocean is so difficult to study using ships, SOCCOM researchers are building and deploying more than 200 ocean-profiling floats, which can collect data summer and winter, day and night, even while underneath sea ice. Dropped overboard from research ships that happen to be traversing the Southern Ocean, each of these floats will drift with the open-ocean currents for up to five years. The floats spend most of their time 1,000 meters below the sea surface. But every 10 days they rise up toward the surface, collecting data as they go. When they reach the surface, they send their data back to researchers on shore, then descend back into the depths. SOCCOM floats carry a wide variety of instruments that collect data on ocean temperature, salinity, pressure, pH (acidity), chlorophyll fluorescence (an indicator of microscopic algae in the water), nitrate (an important nutrient for marine algae), oxygen concentrations, and particles in the water. MBARI researchers helped develop some of these instruments. As part of their grant from the National Science Foundation, SOCCOM researchers wanted to find new ways to share their research with the public. The Adopt-A-Float Program was set up to help engage grade-school students, many of whom would not otherwise get to be involved in large-scale scientific research. George Matsumoto, a senior education and research specialist at MBARI, runs the Adopt-A-Float Program, recruiting teachers and pairing them with researchers who travel across the Southern Ocean to deploy the floats (place them in the ocean). So far almost 50 SOCCOM floats have been named and adopted by students across the United States. The names given to the floats provide a fascinating glimpse into the minds of grade-school students. Gravem’s students at Seaside Middle School named their float “Zazzy, Mac & Cheese” after their class pets (a fish named Zazzy and two mice named Mac and Cheese). Other classes selected names that reflected their school mascots (Sundevil Sam, Cowboys, North Bay Vikings) or named their floats after movie characters and famous researchers (Darwin, E.H. Shackleton). In a statement of resilience following a devastating school shooting, students at the Marjory Stoneman Douglas High School named their float #MSDstrong. “Once we had named our float, the students asked about it every day.” Gravem explained. “They couldn’t wait to hear from the scientists. At one point a big storm rocked the ship and lots of stuff, including the floats, fell off some storage racks. The scientist who wrote the blog was worried that some of the floats might have been damaged. When my kids heard that their float was still working, there was a huge celebration in the classroom! This map shows the track of the float adopted by students at Seaside Middle School from the day it was deployed (December 27, 2017) until the first time it was not able to reach the sea surface due to sea ice (May 8, 2018). Base image: Google Earth. 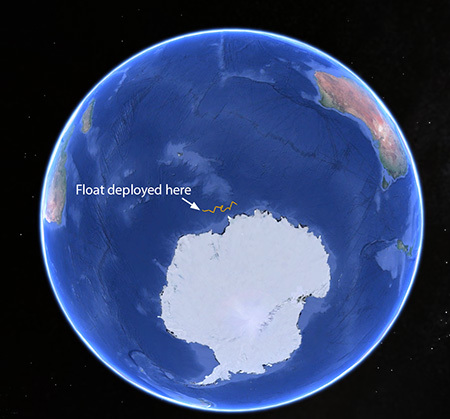 Within a few days after the floats are deployed, they begin sending data back to shore. Students can track their float and download data from it using the SOCCOM website, and teachers often use the data in assignments. Gravem has had her students graph the data from the floats. Several teachers have posted instructions for using the float data and one teacher developed an entire lesson plan around the data. One university professor even used SOCCOM data to teach linear regression analysis. August 14, 2018 – Data from a network of robotic floats carrying high-tech sensors suggest the Southern Ocean may take up much less carbon dioxide from the atmosphere than expected. Aug 10, 2016 - Peering into the insides of a machine can be a useful way to learn about how it works. 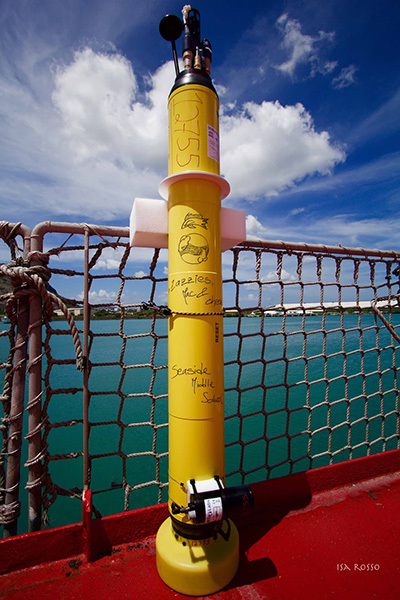 MBARI researchers Ken Johnson and Hans Jannasch created a transparent version of a profiling float, an instrument that makes biogeochemical measurements in the ocean, for educational purposes. Apr 21, 2016 - About a week ago, MBARI marine chemists Hans Jannasch and Ken Johnson went on a little boat ride, chasing an open-ocean profiling float that was drifting in the California Current, about 100 miles offshore. Mar 17, 2016 - MBARI Scientist Ken Johnson and his Chemical Sensors Group are part of a large collaborative effort to place sensors in the Southern Ocean to monitor changing conditions. The video explains the technology used in this project.